In the heart of the historic center of Avignon, (Rue Grande Fusterie) an apartment on the 3rd floor (no elevator), completely renovated in 2016, adjoining the Place de l'Horloge and near the Palais des Papes, museums, theaters, shopping and all amenities. Large living room with sofa and armchairs, TV, coffee table. Fully equipped kitchen (induction hob, oven, microwave, refrigerator, dishwasher, washing machine ...). Table for family dining. All rooms are equipped with cupboards and storage space. A kiss room with shower and bath. Washbasin, mirror, towel and toilet. Wifi internet and private parking. We are a family of 5 adults who enjoyed all the space in this apartment! It is beautifully situated within the city walls of Avignon, with views of the spires of the Pope's Palace from the outdoor patio. The bathroom situation is a separate WC, with a full shower/bath tub, double sink in another room. The apartment is well-equipped and very modern. Our concierge, Frederic, was extremely responsive in meeting us and answering all our questions. We were sad to leave..
Lovely flat in a great area, inside the city walls. This is a spacious, airy flat with lots of room for 2-3 couples. The kitchen is well equipped, and the deck overlooking the Palace of the Popes is large, with a private feeling due to the sight lines. You can walk to everything in Avignon from this location. Parking (private spot included) is around the corner and very convenient. The building is secure with electronic keyed entry. The only drawback is the lack of an elevator. Be prepared to climb three narrow flights. It's great, though, to be on the top floor with nobody overhead. And one word of caution on your arrival. Phillipe (who speaks limited English) will direct you to meet him at 49 Rue de Limas. Your nav system might take you in at the Porte du Rocher onto Rue Ferruce. DON'T! It's confusing and, if it's after hours, there's a bollard that rises out of the street blocking your entrance. Instead, continue west and loop around the ferris wheel, doubling back and entering the walls on Place Crillon, from which you can take a left on Rue de Limas. It's worth a little while studying your map to avoid a lot of trouble getting stuck! The apartment was superb. The owner was very friendly and welcoming, pointing out the best places to go in Avignon. Very steep and windy staircase helped burn off some of the calories from the excellent meals we had. This place was great - centrally located, clean, and our host was friendly and accessible! We had a wonderful time - especially sitting on the balcony and enjoying our view of the Palais des Papes! 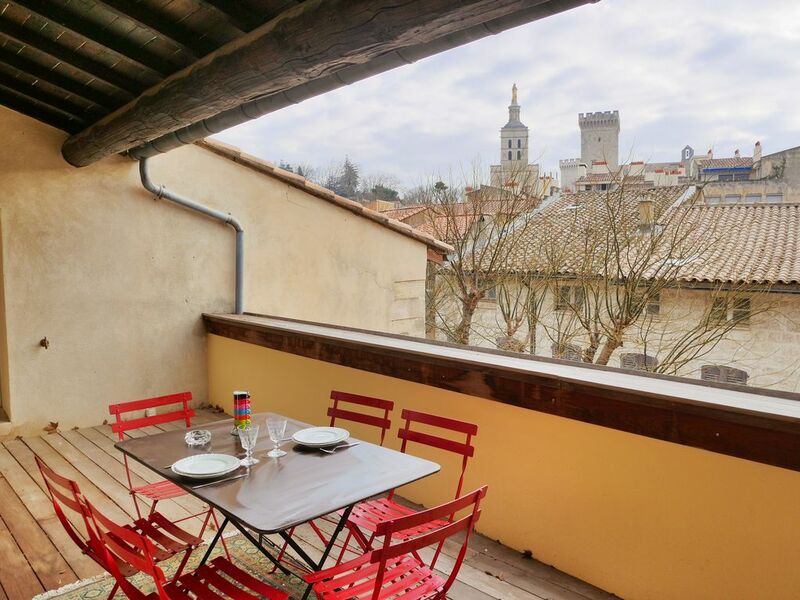 This apartment was spacious, well furnished, sunny, with a nice balcony with a view of Palais des Papes. Frederic was very helpful and very friendly. Thank you! Very nicely renovated apartment. Great communication with the agency managing this property. The apartment takes over the entire top floor. Fantastic view of the Palais des Papes from the big balcony which is perfect for an aperitif at sunset. Spacious living and dining area. Well equipped kitchen. - Heure d’arrivée : 15h à 20h - Heure de départ : 11h maximum - Caution : 500€ rendue lors du départ. - Frais à payer à l'arrivée 70€ (Drap, serviettes et ménage) - Les pièces à vivre sont non fumeurs. --------------------------------------------------------------------------------------------------------------------------- - Check-in : 15h to 20h - Check-out : 11h Maximum - Security deposit : 500€ refounded at check-out. - Charges payable upon arrival € 70 (Sheets, towels and cleaning) - The living rooms are non smoking.